Lucas Stritsman of Troy, N.Y., could hardly be described as a grizzled racing veteran. He is no corporate magnate, either. He and his brother, Evan, own Fire Hearth and Patio, a family business in Colonie, N.Y., that their father, Wayne, started in his garage more than four decades ago. Stritsman, 42, offers a refreshingly fresh face on what Thoroughbred ownership can be. The financial stake he has in 12 horses leads him to spend valued family time at Saratoga Race Course with his wife, Erika, and their children, Klara, 7, and Evan, 5. His passion for racing and Saratoga began the way it did for generations of local fans – with family trips to the track. He would study daily entries and results, take photographs of horses and run down trainers and jockeys for autographs. Once he grew older, he would slip over to the barn area whenever possible. “I was always kind of a barn rat,” he said. Stritsman enjoys checking on his horses as often as possible at the barn of trainer Danny Gargan. He is a popular figure there for reasons that have nothing to do with his operation, Corms Racing Stable. He supplied the grill that Gargan uses to whip up meals for his staff. Stritsman had dabbled in ownership without enjoying much of a result before he met Gargan at Gulfstream Park in 2013. They formed a dynamic combination. Gargan and Stritsman have excelled at finding buying opportunities, often at the lower levels of the claiming game. They also are skilled at placing horses in races they can win – even if it does not always appear that way to others. Stritsman continues to delight in telling the story of Good To Look, a New York-bred that went off at 34-1 in a Saratoga allowance race two years ago. Good To Look got rolling on the lead and he was, indeed, dangerous. The improbable longshot wired the field for the first of his two victories at that meet. As much as he relishes his memories of Good To Look, he will never forget the urgent phone call he received from Gargan in March, 2017. Gargan was thrilled to see Divine Miss Grey, a 3-year-old filly, available for $16,000 in a claiming race at Gulfstream. Gargan told Stritsman he saw her as a rare opportunity, and he was right after winning a four-way shake for her. Divine Miss Grey continually improved under the watchful eyes of her new connections, opening this year with consecutive victories at Aqueduct in the seven-furlong Interborough and the one-mile Heavenly Prize Invitational before she placed second in the Grade 3 Distaff Handicap at seven furlongs, also at Aqueduct. “She's kind of a one in 10-year type of horse, maybe one in 15, maybe one in a lifetime,” Gargan said. She is the kind of filly that the late Matt Canfield would have appreciated. Canfield regularly accompanied Stritsman to the track. He was nicknamed “Corms” for reasons unknown. He was always known to be packing a cooler. Canfield died on April 4, 2011 at age 35. He had been out late and was found at the bottom of a flight of stairs after he failed to respond to phone calls. Stritsman is determined to keep his memory alive through Corms Racing Stable. He sends photos of every winner to Canfield's mother, Kathy, who continues to struggle with her loss. Stritsman feels as though “Corms” is with him in the paddock, in the stands, in the winner's circle. “He's rooting for us, for sure,” he said. 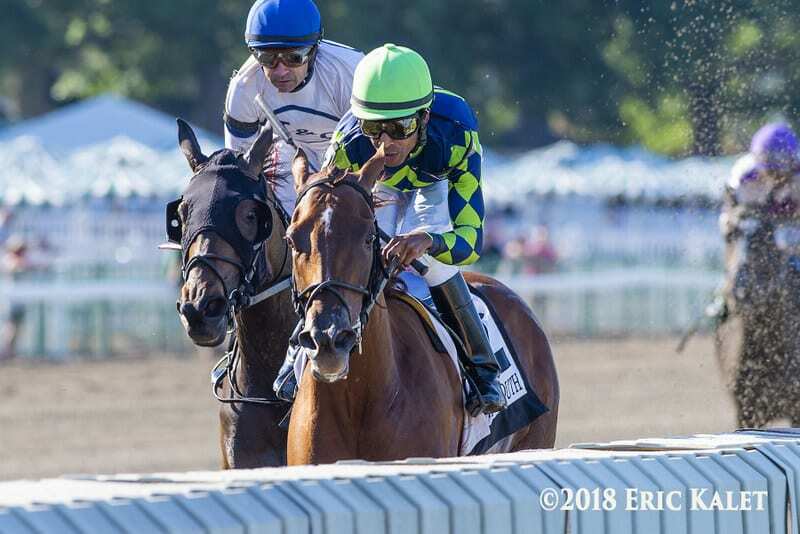 This entry was posted in People and tagged Danny Gargan, divine miss grey, Lucas Stritsman, New York racing, saratoga, thoroughbred owners, tom pedulla by Tom Pedulla. Bookmark the permalink.